Many Sheepcote students enjoyed success at the Winter National Championships 2012. Lucy Pincus riding Sheepcote Doncalisto. Well done to all of the Sheepcote students. Lucy Pincus fought off hot competition at the Dressage U21's UK Summer Championships (Addington Manor, 23-24 July) to be crowned the Open Novice Challenge Champion. She rode her fathers 5 yrs old home bred gelding Don Calisto (out of Don Schufro) to victory in all four tests and achieved a personal best score of 80.42% in the Novice 28. 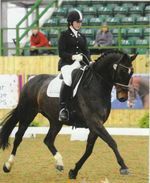 Lucy Pincus saw off her more experienced rivals to score a double at Abbey Dressage's first affiliated dressage date of 2011, at Fiddington. The 14-year-old daughter of international dressage riders David and Serena Pincus scored two wins on the home-bred seven yrs old pony Sheepcote Sandmartin. Herefordshire teenager Lucy Pincus, 13, headed a large field of 29 riders to secure victory in the Petplan Equine Novice Restricted Area Festival Championship. Riding Serena Pincus's seven-year-old 14.2hh gelding Sheepcote Sandmartin she won this championship class, against mostly senior riders, with a strong score of 70.69%.